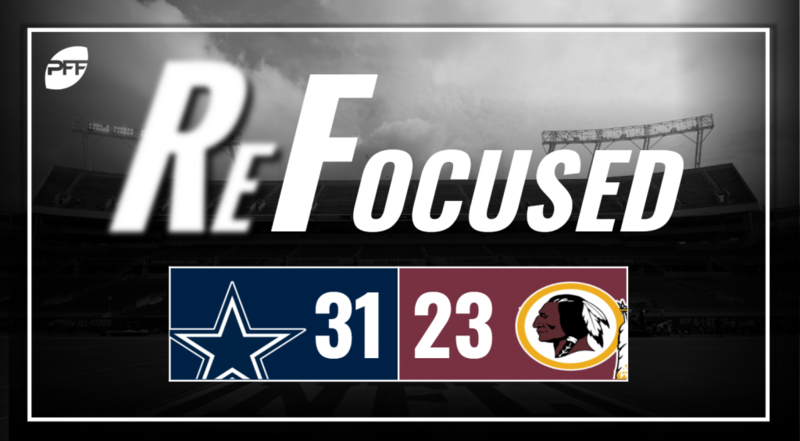 The Dallas Cowboys defeated the Washington Redskins, 31-23, in Week 12 of the 2018 NFL season. Dallas found success utilizing stunts on defense. With movement along their defensive line, they were able to get pressure on Colt McCoy and turn that pressure into sacks and hits too, making the Redskins new starting quarterback uncomfortable early and often. It was an up-and-down game for linebacker Leighton Vander Esch, but once again he made the plays in coverage that have highlighted his rookie season. With the Redskins trying to get back in the game in the fourth quarter, he had a pass breakup on a play where McCoy had scrambled and was looking to hit a receiver in the back of the end zone. This was the type of performance that Dallas probably had in mind when they traded a first-round pick to the Oakland Raiders in exchange for wide receiver Amari Cooper. He was the best player on the field this afternoon, as he converted multiple key third downs. Furthermore, he also caught two long touchdowns, as he recorded 180 receiving yards on eight catches. With left tackle Tyron Smith out, running back Ezekiel Elliott did not get a lot of help from his offensive line, as the Washington defensive line was often in the backfield disrupting Elliott’s runs. However, Elliott did end up with 121 rushing yards largely due to him gaining yards after contact and finding space on the outside. Trent Williams missed just one snap for the Redskins in his return to action, and while they scored on the play, his importance was evident on that snap. Replacement Ty Nsekhe was bull-rushed back towards McCoy by Randy Gregory, with the Cowboys defensive end recording a hit on the play. With some stout run defense, particularly up the middle, Dallas held Adrian Peterson to just 35 yards for the game and an average of just 2.9 yards per carry. Washington interior defensive lineman Jonathan Allen had a solid outing against the Cowboys, as he led his team in solo tackles with five despite playing in the trenches. Allen played a key part in forcing Elliott to cut to the edges instead of running inside. In addition, he also contributed to the Redskins’ pass rush by getting to Dak Prescott multiple times and sacking the Dallas quarterback once. Washington’s secondary struggled for most of the afternoon against the Cowboys. The Redskins defensive backs failed to break up many passes and were unable to limit yards after the catch, especially to Cooper on his two long touchdown runs. In addition, they also gave up a first down due to a penalty on a key third down. Cooper was too much to handle for the Redskins’ secondary, as he made plays right when the Dallas offense needed him most to step up. Cooper’s two long touchdown runs essentially decided the game and put it out of reach for Washington. This was a game that saw the Redskins punished for their mistakes, with key turnovers going against them. Plays like the Lawrence interception where right tackle Morgan Moses missed the cut block on the defensive end, allowing him to get his arms into the throwing lane, doomed them to defeat.